I'm sure you thought that you were going to see a fireworks photo again. 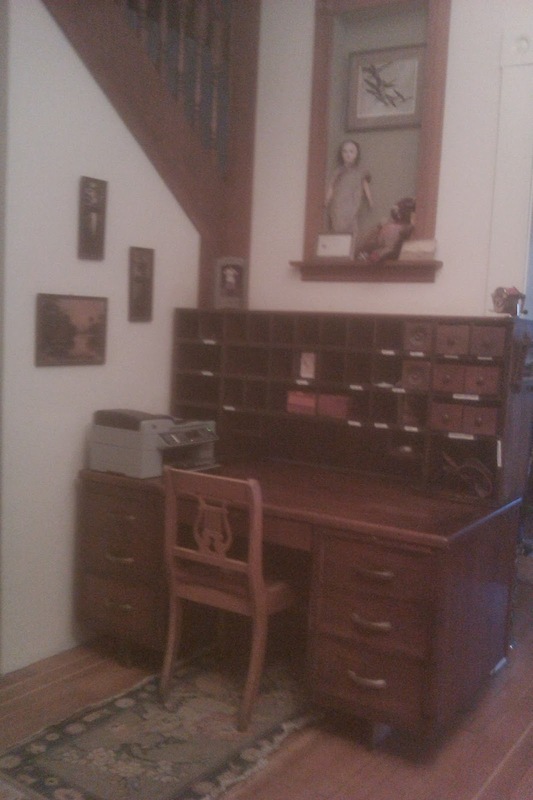 Instead you got my old desk and the antique Nebraska post office sorting-cabinet sitting heavily on top of it. When I woke up this morning I was mulling over New Year's past. I've been around for so many of them. Extra in fact, because Baha'i's celebrate the first day of our calendar, Naw Ruz, which falls around the spring equinox. I was wishing that I had kept a better record of those yearly intentions and that made me think of the Nebraska post office cubbies. In the day of handwritten notes and letters, I would have thought we kept better track of our intentions. The cubbies in the post office cabinet look pretty empty in this photos, but I had just switched desks and had taken everything out of the them. The desk is a sign that this past year there were a few movable parts in my life. The desk was donated to The Kids' Place twenty-eight years ago when I helped get the school started. It represents hours of intentions. When I retired this year, I was gifted the desk. I've had the post office cabinet for ten years or so and love stuffing it with letters, maps, cards and photos. Not one cubby hole in the cabinet is the same size. I know that the cabinet came from a little town. So little that it apparently didn't have a cabinet maker. (I maybe even went through that town during the drive through Nebraska. There were lots of places that would have qualified.) Someone made this cabinet with a simple intention, executed with little measurement and even less skill. The cabinet served it's intention for decades through wars, farm sales, baby and wedding announcements and letters announcing death. When I think about New Year's past I know that I made intentions and mentally made lists of accomplishments. I am going to infer that my intentions served me well enough most of the time, even if the execution was sometimes less than perfect or didn't measure-up to what I was going to do that year. So here is my New Years intention about list-making. During a particularly stressful time in my life, I made lists at the end of the day. Not for what I was going to do the next day, but what I had done that day. I would then proceed to check off everything on the list, knowing that it was all done. The exercise was a most satisfying way of looking at life. I think that from now on I'll not make New Year's intentions, but make New Year's lists.. for last year's doings and check them off carefully, measuring well with hindsight. Happy New Year list-making to you all.